This compact electric-pneumatic driven injection vacuum blasting machine with an average blasting pattern of 16 mm width, is excellent to apply for blast cleaning weld seams, spot blasting of smaller areas, inspection and repair of engines and machinery overhaul, bodywork on vehicles. LTC vacuum blasting machines are characterized inter alia by many applications and the wide variety of accessories available for each model . Over the years LTC has offered many mobile and stationary beam solutions, in consultation with the end user LTC ray machines with minor modifications made ​​are optimally suited for the task. Brush in our catalog are the most widely used standard brushes and attachments for the use of different models LTC machines. In addition, LTC International has the knowledge and skills at home that she allows for many specific applications to develop and deliver customized accessories. 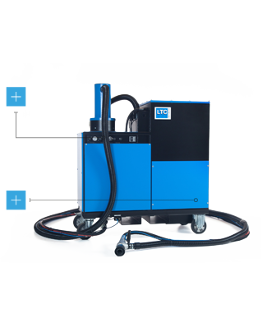 The electric-pneumatic driven LTC 1030 injection vacuum blasting machine with an average blast pattern of 20-22 mm width, is particularly useful in the pre-and post-processing of weld seams. Also well applicable for spotblasting of smaller areas, inspection and repair of engines and machinery overhaul, engineering, natural stone work, bodywork on vehicles and abrasive blasting within production processes. LTC vacuum blasting machines are characterized inter alia by many applications and the wide variety of accessories available for each model . Over the years LTC has offered many mobile and stationary beam solutions, in consultation with the end user LTC ray machines with minor modifications made ​​are optimally suited for the task. Brush in our catalog are the most widely used standard brushes and attachments for the use of different models LTC machines. In addition, LTC International has the knowledge and skills at home that they are able for many specific applications proposing to develop and deliver customized accessories. This fully pneumatically driven injection vacuum blasting machine with an average blasting pattern of 20-22 mm width, finds its application mostly in the blast cleaning of weld seams. This unit is, like the EP version, well applicable for spot blasting, inspection and repair of engines and machinery overhaul, bodywork on vehicles. 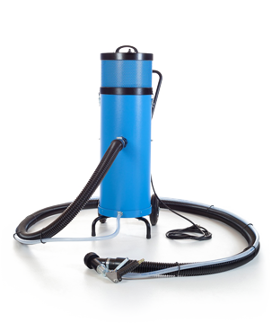 The fully pneumatic version is, with the absence of necessity of an electric power supply, the most ideal mobile machine for outdoor use like graffiti removal. LTC vacuümstraalmachines kenmerken zich onder meer door de vele toepassingsmogelijkheden en de grote verscheidenheid aan accessoires die bij elke model verkrijgbaar zijn. Door de jaren heen heeft LTC vele mobiele en stationaire straaloplossingen geboden, waarbij in overleg met de eindgebruiker de LTC straalmachines met kleine aanpassingen optimaal geschikt zijn gemaakt voor zijn taak. In onze borstelcatalogus vindt u de meest gebruikte standaard borstels en opzetstukken voor het gebruik van de verschillende modellen LTC machines. Daarnaast heeft LTC International de kennis en kunde in huis die ze in staat stelt voor vele specifieke toepassingen aangepaste accessoires te ontwikkelen en leveren. This electric-pneumatic driven injection blasting machine with an average blasting pattern of 28-32 mm width is frequently used for blasting the heavier weld seams, grit blasting axes and cylinder shafts, larger machine parts before inspection and repair, shipbuilding, railway industry and maintenance, engines and engine overhaul, bodywork of vehicles and trailers, container overhaul, storage tank and vessel construction. This fully pneumatically driven injection blasting machine with an average blasting pattern of 28-32 mm width is similar as the electric-pneumatic version, often used for blasting the heavier weld seams, grit blasting axes and cylinder shafts, larger machine parts before inspection and repair, shipbuilding, railway industry and maintenance, engines and engine overhaul, bodywork of vehicles and trailers, container overhaul, storage tank and vessel construction. Due to the absence of necessity of an electric power supply, this machine is ideally suited for mobile applications on location ‘in the field’ and minor repair work on larger projects and removing graffiti. This model “pressure fed“ vacuum blasting machine is available in various versions, which makes it able to choose the best suitable machine for the blasting job. The LTC 1060’s design is mostly used for vacuum blasting with light and medium weight abrasives such as aluminium oxide, garnet, olivine sand, glass beads and plastics. With an average blasting pattern width of 50 mm, this machine is often used in the following applications; tank construction, heavy steel constructions, yacht and ship construction, weld cleaning and finishing, on- and offshore pipeline industry, thermal metallizing coating processes, rubber roll cladding, aircraft industry, maintenance at refineries, granite and natural stone works, concrete construction and overhaul, road markings and linings, polyester and glass fibre industry, rolling and colander industry (plastics, paper).ingen en belijning, polyester en glasvezel industrie, wals en kalanderindustrie (kunststof, papier). This model “pressure fed“ vacuum blasting machine is available in various versions, which makes it able to choose the best suitable machine for the blasting job. The LTC 1070 version is used for vacuum blasting with the lighter, medium abrasives (Al2O3, garnet, olivine sand, glass beads and plastics) and especially metallic abrasives such as steel grit/shot and cast iron grit. With an average blasting pattern width of approx. 50 mm and high production capacity, this versatile machine is often used in the following industries; storage tank and heavy steel constructions, ship building industry, blasting and finishing weld seams, on-and offshore pipeline construction industry, thermal metallizing and coating processes, rubber cladding, aerospace, transportation, maintenance refineries, granite and natural stone work, concrete construction and revision , road markings and lines, polyester and fibre industry, rolling and colander industry (plastics, paper). 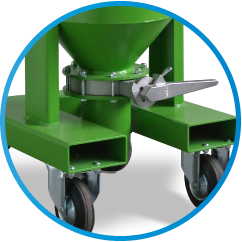 is specially engineered for high quality, high production grit blasting applications where limited space is available. 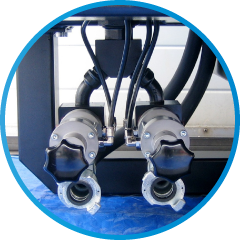 By making use of two blast heads (blast nozzles) on a single vacuum blasting machine, the production capacity achievable, is twice as high as possible with a standard “single head machine”. 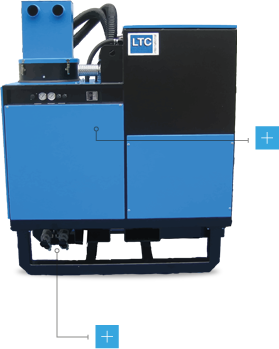 The LTC 1070 EPE Dual is mostly used in (semi-) stationary applications such as blast cleaning the connecting weld seams at on- and offshore oil and gas pipeline constructions. 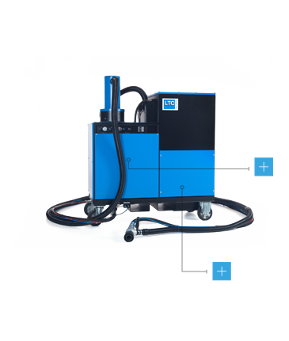 With the aid of a powerful and reliable electric driven vacuum generator , the compressed air consumption necessary for running this machine, is kept to a minimum while the blasting speed at high pressures (using metallic abrasives) is excellent. By making use of the ‘double chamber’ pressure vessel system in the LTC 1070 EP, it is possible to perform long time non-stop blasting processes (Large cylinder rods, colander rolls, Yankee rolls etc.). This electric driven vacuum recovery machine is characterized by its solid construction and finish, its simplicity and high operating reliability. 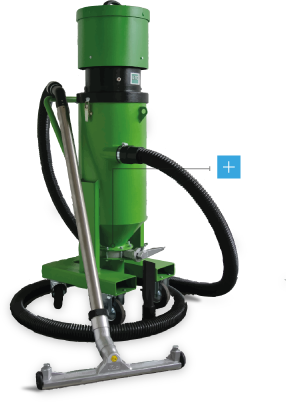 The 2.000 Watts of vacuum power can be used for cleaning floors, working areas and machinery. 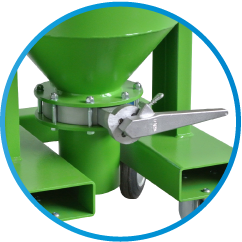 It can also be used for the recovery and cleaning of abrasives, granulates, chips and heavy dirt particles. 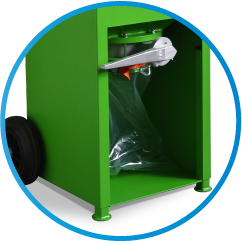 The recovered material can simply be removed by lifting and draining the machine over a larger bin or bag. 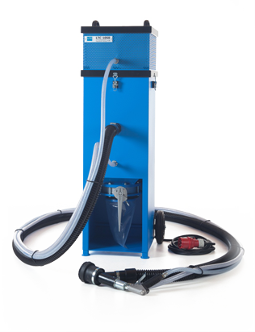 The delivery of this machine comes standard with a 5 meter high abrasion resistant, polyurethane lined hose and various suction heads. Next to the standard delivery, a wide range of different suction heads are available. This fully pneumatic driven vacuum recovery machine is characterized by its solid construction and finish, its simplicity and high operating reliability. 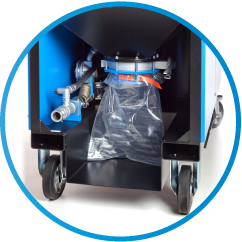 The LTC 2030 PN can be used for cleaning floors, working areas and machinery. It can also be used for the recovery and cleaning of abrasives, granulates, chips and heavy dirt particles. 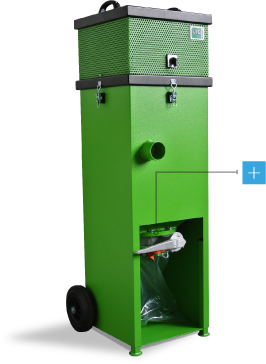 The recovered material can simply be removed by lifting and draining the machine over a larger bin or bag. 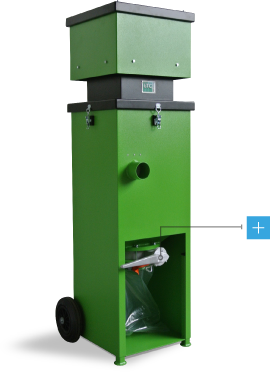 The delivery of this machine comes standard with a 5 meter high abrasion resistant, polyurethane lined hose and various suction heads. 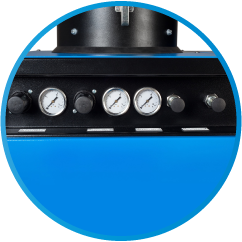 For the saving of compressed air, the machine can be featured with a pneumatic remote on/off switch. Next to the standard delivery, a wide range of different suction heads are available. 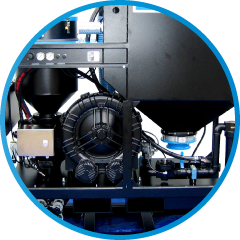 This electric driven version of the LTC 2050 vacuum recovery machine is characterized by its solid construction and finish, its simplicity and high operating reliability. 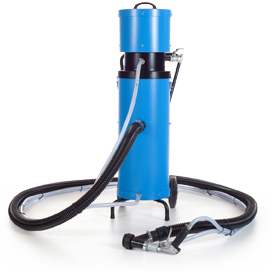 The 3.000 Watts of vacuum power can be used for cleaning floors, working areas and machinery. It can also be used for the recovery and cleaning of abrasives, granulates, chips and heavy dirt particles. The recovered material can simply be removed by opening an air tight dust valve. Similar as on de LTC 2050 PN version the recovered materials in the hopper can be drained in a solid plastic dust bag or dustbin. 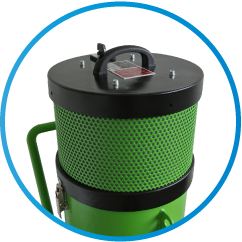 The delivery of this machine comes standard with a 5 meter high abrasion resistant, polyurethane lined hose and various suction heads. Next to the standard delivery, a wide range of different suction heads are available. This fully pneumatic driven vacuum recovery machine is characterized by its solid construction and finish, its simplicity and high operating reliability. The LTC 2050 PN can be used for cleaning floors, working areas and machinery. It can also be used for the recovery and cleaning of abrasives, granulates, chips and heavy dirt particles. The recovered material can simply be removed by opening an air tight dust valve. 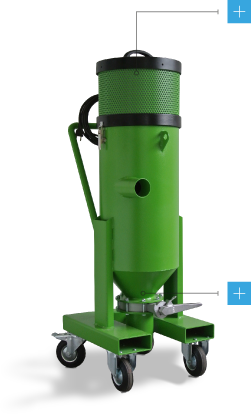 Recovered materials in the hopper are drained in a solid plastic dust bag or dustbin. The delivery of this machine comes standard with a 5 meter high abrasion resistant, polyurethane lined hose and various suction heads. For the saving of compressed air, the machine can be featured with a pneumatic remote on/off switch. Next to the standard delivery, a wide range of different suction heads are available.